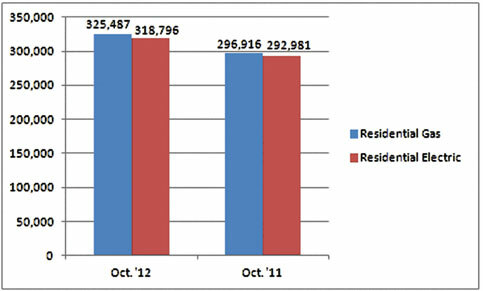 U.S. shipments of residential gas storage water heaters for October 2012 increased 9.6 percent, to 325,487 units, up from 296,916 units shipped in October 2011. 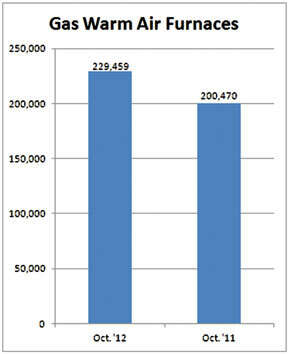 Residential electric storage water heater shipments increased 8.8 percent in October 2012, to 318,796 units, up from 292,981 units shipped in October 2011. For the year-to-date, U.S. shipments of residential gas storage water heaters decreased 2.1 percent, to 3,186,460, compared to 3,256,173 units shipped during the same period in 2011. Residential electric storage water heater shipments decreased .1 percent year-to-date, to 3,077,316 units, compared to 3,080,205 units shipped during the same period in 2011. 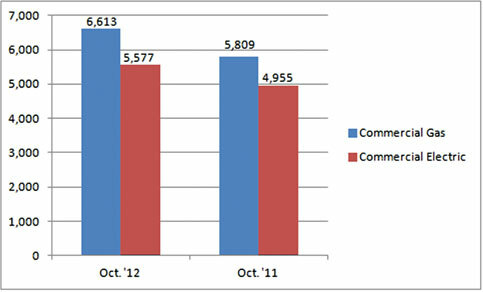 Commercial gas storage water heater shipments increased 13.8 percent in October 2012, to 6,613 units, up from 5,809 units shipped in October 2011. Commercial electric storage water heater shipments increased 12.6 percent in October 2012, to 5,577 units, up from 4,955 units shipped in October 2011. Year-to-date U.S. shipments of commercial gas storage water heaters decreased .8 percent, to 66,374 units, compared with 66,882 units shipped during the same period in 2011. Year-to-date commercial electric storage water heater shipments increased 14.1 percent to 57,453 units, up from 50,353 units shipped during the same period in 2011. U.S. shipments of gas warm air furnaces for October 2012 increased 14.5 percent, to 229,459 units, up from 200,470 units shipped in October 2011. 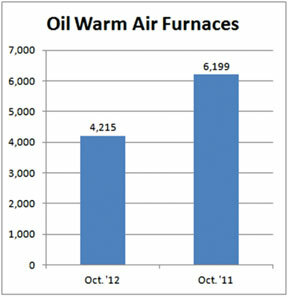 Oil warm air furnace shipments decreased 32 percent, to 4,215 units in October 2012, down from 6,199 units shipped in October 2011. Year-to-date U.S. shipments of gas warm air furnaces increased .8 percent, to 1,787,264 units, compared with 1,772,227 units shipped during the same period in 2011. 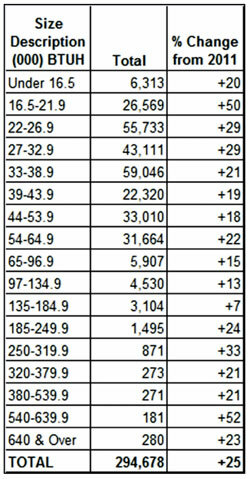 Year-to-date U.S. shipments of oil warm air furnaces decreased 27.9 percent to 27,567, compared with 38,217 units shipped during the same period in 2011. U.S. shipments of central air conditioners and air-source heat pumps totaled 294,678 units in October 2012, up 25.1 percent from 235,603 units shipped in October 2011. 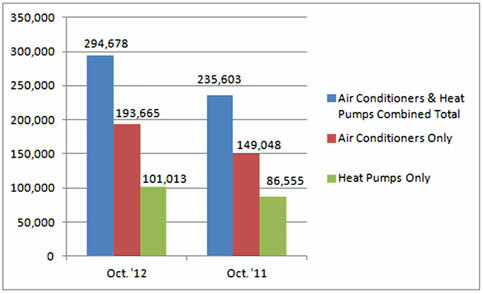 U.S. shipments of air conditioners increased 29.9 percent, to 193,665 units, up from 149,048 units shipped in October 2011. U.S. shipments of air-source heat pumps increased 16.7 percent, to 101,013 units, up from 86,555 units shipped in October 2011. Year-to-date combined shipments of central air conditioners and air-source heat pumps increased .3 percent, to 5,019,006 units, up from 5,005,004 units shipped in October 2011. Year-to-date shipments of central air conditioners increased 2.9 percent, to 3,526,655 units, up from 3,425,467 units shipped during the same period in 2011. The year-to-date total for heat pump shipments decreased 5.5 percent, to 1,492,351 units, down from 1,579,537 units shipped during the same period in 2011.